In her blog post Copyright Laws and Why My Head May Explode, "jediane9," after reading about Roni Loren's financial settlement with an unnamed photographer for displaying his photo on her blog without permission, bemoans "copyright trolls." Larger companies actually hire people called “infringement trolls” to scope the web looking for photos used without permission. And really, all those infringement trolls have to do is go to Pinterest, because that site is about 99% copyright infringement. It's always the same arguments. Victims of copyright infringement are vilified; they're supposed to be nice, and write a polite note asking for the infringing material to be removed. Infringers don't understand that the majority of photographers/artists will, in fact, rarely experience the need to go beyond a polite request or a DMCA take-down directly to the web host. Once the search for copyright infringements and serving of take-down notices becomes an onerous, repetitive and time-consuming task taking too much away from their creative efforts, they will start thinking of using the citizen speed trap that copyright laws allow them to use. That is, ask for cash compensation. But if you post a photo of something you like, even go so far as to credit and link to the original source, how is that a bad thing? You’re not gaining anything from it, and I don’t think (re: I’m totally not sure) the artist is losing anything from it. If anything you’re helping promote their art, right? Here we go. The "it's non-commercial use!" - "artists aren't losing!" - "but I gave proper credit!" and "it's great promotion!" mashed together in one paragraph. This exemplifies what people just don't get. 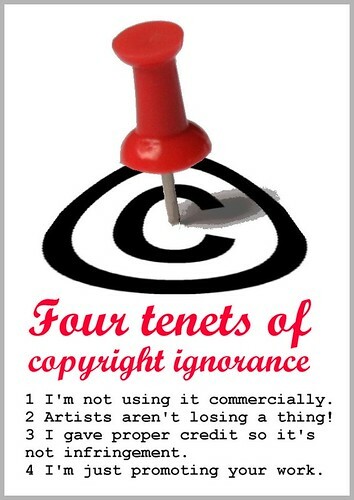 It embodies the four tenets of copyright-ignorance that Pinterest is exploiting. It may be done routinely, but it's never morally right to exploit ignorance, especially not to the extent that Pinterest does. But in all honestly, bloggers and reviewers like me only have good intentions when we post something that “belongs” to someone else. Thoese "good intentions" come directly from the deep well of ignorance about how artists monetize their work. The road to a lawsuit and a cash settlement is paved with such good intentions. I agree that the "but I'm doing you a favor," excuse is based in ignorance. When most creators allow this kind of use, no doubt the person infringing goes on believing it's legal. But creative types cannot spend all day hunting down infringements and sending polite notes and/or DMCA takedowns. I understand the need, and the logic, in turning over that task to a service. Sometimes the service doesn't operate w/the same discretion the creator might. E.g., I have let it go when people are JUST sharing...meaning they use only a thumbnail, credit and link to me, are not using it in a way I object to, and are not removing or altering ownership of it. That's a basic thing, I have to evaluate all uses I find, individually. That's what services don't do; evaluate on an individual basis. But I can tell you I send a takedown any time I find my work on Pinterest. And for all the many reasons stated here and elsewhere.